I think I found my 03A3 load! Thread: I think I found my 03A3 load! What grain bullet is the 311299? Good shooting! I've got a 2 groove BBL'd 03 with a Redfield peep sight that I'll have to try your load in. The boolet weight is around 203grs as caste, and then with GC, and lube it runs around 205grs. Play around with the load, as a few 10ths of a grain changed the group allot!! I am using Fed Match primers. I use this bullet in my two groove 1944 Remington 03A3 with 20 gr. of Reloader 7, '69 Lake City case and a Rem. Magnum primer. 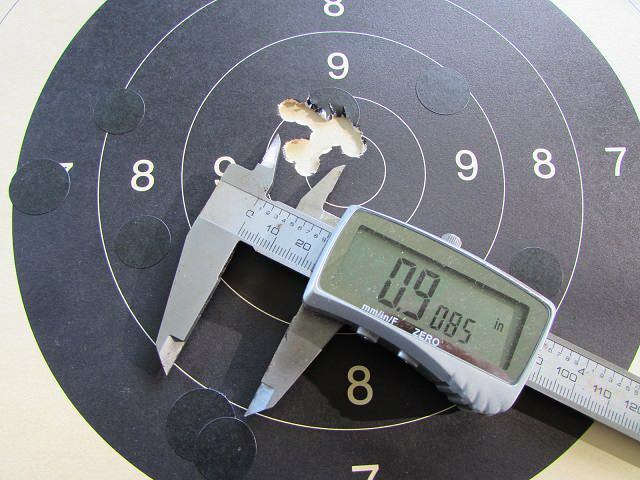 An outstanding target load that is scary accurate! Is Rx7 and Reloader 7 the same thing? Who are they made by? Puts a big smile on your face when it all comes together doesn't it? Then to the next rifle! My O3 has a 4 groove barrel and I use the Lyman 311284 (208gns) as cast, sized to 0.310" in neck turned and unified brass. This 10 shot group was the first of 2 benchrested at 100yds. My load is 31gns of a local powder equivilant to Dupont 3031 for 1740fps. Sorry, I use a 12X scope! Wallace, that 12x scope does help... LOL! That is a great group. Let me see how close I can get with the stock peep site... My bullets are sized to .309 diameter... in my 4 groove 03 it just likes the .309 better... absolutely no leading after 10 shots... I like that!! I'm glad that I read this post because I recently got a SC 03-A3 made in 1943 that has been sporterized and all the loads mentioned really shoot good in it. For war time production military rifles, the 03A3 is an amazing rifle! Where there is lots of things to do. Yeah, I love cast iron cookware. Life is too short. Live yours to the fullest. The old saying was the Brits made battle rifles, Germans made hunting rifles and the Americans made target rifles. My 03-A3 shoots beautifully oth a NOE 311299 of wws, sized to .310” over 18grns 4759, bullets seated touching lands. My second favorite cast bullet launcher! Have to say that I'm amazed by my 1903-A3 with a 2 G barrel. I size to .310 and have tested several bullets to date. A club that I shoot at has a match nearly every Sunday. Twice a month they hold a match that is 10 shots at each of 4 ranges, 200, 300, 400 and 500 yards. To date all of my best scores have been with the Lyman 311334 GC bullet. I use this bullet in my 03-A3 and a custom 700 Remington 308 with a Hart barrel. In the 06 I push this bullet with 17.5 grains of 2400 powder. It burns clean and there is no leading. In the 308 I push it with 15.5 grains of SR4759. Both rifles are scoped. The O3-A3 has a 16X unertl and the 308 a 3.5-15X NF. The Lyman 311334 GC bullet is delivering the best accuracy at the longer ranges than any other bullet I have tried to this date in both rifles. My post got away from me while I was trying to insert an image of the targets I have shot with the loads I made mention of. I just don't remember how to attach a photo at this point. I use a load of 30.0 grains if IMR3031 in my SC 1903-A3 propelling my cast Lyman 311284, ignited with CCI34 primers in used military brass. My results are nowheres even near as tight a group as you've achieved -- kudos -- but it is, indeed, a great load. IMR3031 is my "go to" powder, and I'm happy to read others (e.g., you) are using it for '06 loads in these bolt guns. (I've never tried this load in a Garand; just acquired one, but for now, I may stick to jacketed bullets for this (CMP rack grade) rifle. Again, the L311284 load works great not only in the 1903A3, but also in my 1917). Ok, where are you guys getting 4759??? It's been stashed in their powder magazines for years!